The ThINKin' Spot: Lots of Peachy Keen Fun!!! Hello and happy Sunday! Thought I'd take a minute to make a quick post and share one of the pictures from my week in the land of Peachy Keen. I sure had a great time painting, playing with paper, and chatting with some of my design team sisters, and I was sad to see it end. From left to right we have on the front row: Kathy J., Vivienne Holden, and Lisa Buttafuoco. On the back row is: Janice Wilson, Lorie (that's me), and Kim Score. Wow, I just can't say enough great things about this group of girls. Talented, hilarious, and so much fun to be around!!! It was a great week, and one I'll remember and cherish for a lifetime! Hope you're having a great Sunday! 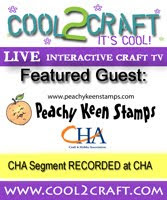 Thanks so much for stopping by, and please check back tomorrow for the winner of the $15 gift certificate from the PKS Blog hop, as well as a peek at some of the crafty things I made while visiting Peachy Keen headquarters!!! Oh, and before I forget, have you heard about the 1st anniversary celebration going on at Market Street Stamps? 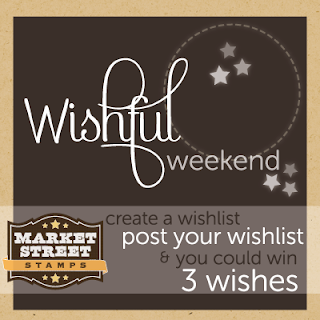 There's so many ways to play along and win fabulous prizes, and one of those is the Wishful Weekend contest. You can find all the details here. I just created my list, so now I'll keep my fingers crossed and hope I win, but if not, then I feel a shopping spree coming on!! LOL!!!!! Those are the best of times. Where do you go? I can tell from the smiles it was a wonderful time. Awwwwww Lorie! It sure was so wonderful to spend time with you and the rest of the girls! We should make it a yearly event! Love you! Glad you are home safe and sound! Nothing like lots of love and laughter to keep your mojo from languishing!! So glad you ladies could all get together! Lorie, you are the sweetest! I had such a wonderful time crafting with you, riding around town and shopping. Too bad I wasn't there earlier in the week although I was much sicker (if that's possible). I look forward to future get-togethers!